FORT WORTH, Texas - On Friday, June 25, the Texas Second Court of Appeals granted the Diocese's Petition for Writ of Mandamus and instructed the 141st District Court to modify its ruling of Sept. 16, 2009, to the effect that there cannot be a second Episcopal Diocese of Fort Worth and a second Corporation of the diocese. Applying neutral principles of law, Friday's decision found that "a corporation cannot sue itself" and that "it is undisputed" by both plaintiffs and defendants "that there is only one Corporation and one Fort Worth Diocese." "[W]hile Mr. Nelson and Ms. Wells may be authorized to represent the individuals who hired them," the appellate court said, "these attorneys have not established their authority to represent or appear on behalf of the Fort Worth Diocese and Corporation as required by rule 12 [of Texas Rules of Civil Procedure]." The ruling dismisses that portion of the original suit that "is purportedly brought on behalf of the Corporation and [Fort Worth] Diocese." The trial court must "strike the pleadings filed by Mr. Nelson and Ms. Wells on behalf of the Corporation and the Fort Worth Diocese and bar them from appearing in the underlying cause as attorneys of record for those named plaintiffs." The appellate court also lifted the stay of proceedings, clearing the way for the trial court to comply. To the plaintiffs' argument that this decision could be delayed, the Court of Appeals responded that there was no need to wait for the eventual conclusion of the trial to correct the trial court's abuse of discretion, since that could add unnecessary costs to the burden of litigation initiated by the April 2009 suit. It noted, too, that the trial court judge would be "unnecessarily confused by presentations from two opposing factions who claim to be the Corporation and the Fort Worth Diocese." While it declined to settle the question of "identity," the appellate court affirmed that conventions of the Diocese and the Corporation formed in 1983 and led by Bishop Iker voted in 2007 and 2008 to withdraw from membership in TEC and enter into membership in the province of the Southern Cone, and that Bishop Jack Iker and the Corporation's board were all duly elected to their positions. Bishop Iker requests continuing prayers of thanksgiving and guidance for our lead attorneys, Shelby Sharpe and Scott Brister. A Significant Victory for the Diocese of Fort Worth in Court! Thanks be to God! While it doesn't settle the lawsuit that the TEC-affiliated, rump, so-called "diocese of Fort Worth" has brought against the actual diocese of Fort Worth (ACNA), yesterday Texas' Second Court of Appeals handed down a ruling that is a significant victory for us. In essence the appellate court ruled that the lawyers who have filed suit on behalf of the minority TEC rump faction do NOT represent the Episcopal Diocese of Fort Worth and its associated corporation. This is big because TEC's strategy all along has been simply to assume what really is one of the chief issues that must be litigated. They have assumed that the "+Gulick group" (the small, TEC-loyalist rump now claiming to own all the property of our diocese) is the REAL leadership of the REAL Episcopal diocese of Fort Worth and that Bishop Iker and the other leaders who have lead our diocese for years have essentially stolen the "real" TEC diocese's property and are now holding it illegally. The TEC rump's lawyers were trying to pull the wool over the trial court's eyes and get the judge to accept this argument without even hearing the facts behind our departure from TEC! Of course, the TEC rump can still file suit again and I am certain that they will. But this time they will have to do so as individuals and actually PROVE that they have a right to run the only existing "Episcopal diocese of Fort Worth" and its corporation. They will have to prove, among other things, that there was something so fundamentally wrong with the procedures by which an almost 80% majority of the delegates to two diocesan conventions called a full year apart voted to leave TEC that these errors mean the leadership associated with Bishop Iker automatically vacated their posts as officers of the diocese and its corporation when the conventions' votes were taken. But Bishop Iker and the other legitimate leaders of our diocese took extraordinary care to see that every canonical "I" was dotted and every legal "T" was crossed during the more than two long years we took to withdraw from TEC. I cannot see how the TEC-loyalist rump can possibly hope to convince a Tarrant County jury that the real leadership of our diocese is actually a liberal faction loyal to a bunch of folks in New York City who were recognized as legitimate by no more than 20% of the membership of our diocese as its stood before the split. The rump TEC-loyalist "diocese" has got a very hard row to hoe now if they continue to try to deprive the people of our parishes of their buildings! Read the entire decision and opinion here. What does it sound like when five dozen teenagers sing a Kyrie? 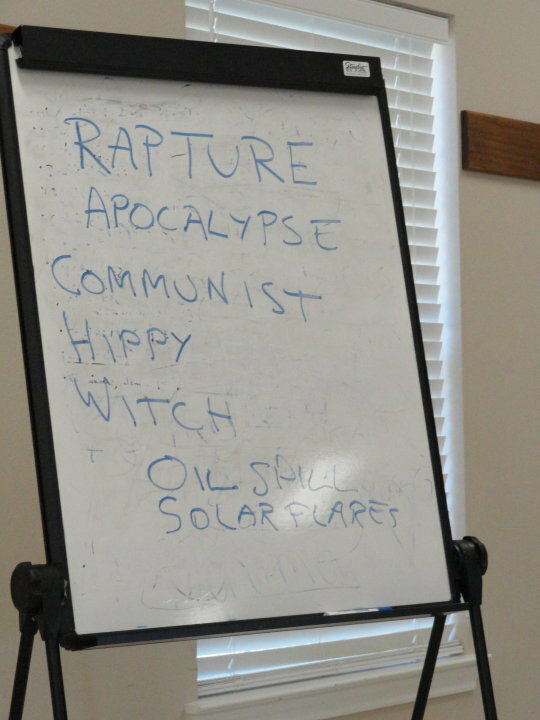 Here is a small fragment of the daily worship from last week's St. Michael's Youth Conference--Southwest. That is one great group of young people and adult mentors! Bishop Ackerman's Call for a "New Oxford Movement"
Bishop Keith Ackerman, retired bishop of Quincy and a leader of Forward in Faith, North America, recently called for a "new Oxford Movement" in a talk presented to that august body. Since a couple of commenters on my post below about St. Mike's asked for my opinion of this talk (or that of others inside this diocese--which sadly I cannot speak to as I have not heard another clergyman or layman in the diocese mention this talk yet) I thought I would post a link to the bishop's talk here and offer a few remarks. This talk is more than half-an-hour long, but readers of this blog who are pressed for time can probably skip to 29:00 and get the gist of what the bishop is calling for here. And frankly, for most of my readers I doubt that the renewal of the Oxford Movement (and especially its ecclesiology) that Bishop Ackerman is calling for will come as a shock. The bishop, for instance, calls for a "recovery of an identity that reaches back to the apostles." He emphasizes that it is the substance of the apostolic Faith that must be re-emphasized, not merely the "tactile apostolic succession" stretching back to antiquity through the laying on of hands. In the last few minutes of his talk Bishop Ackerman makes reference to a "return to the doctrine of the early Church--to the Patristic age." He also emphasizes the significance of the Caroline divines to this undertaking and speaks of the "unique" English Catholic expression represented by the spirituality of the English Church "pre-Whitby" (i.e., a reference to the time before the Synod of Whitby in 664 A.D.). What I take Bishop Ackerman to be calling for here is a renewed commitment to the Faith of the undivided Church in antiquity--the Faith of the Seven Ecumenical Councils of the Church, the Faith shared by the universal Church before schism sundered her East and West. This is precisely what I personally have always understood as "the Catholic Faith." So I can lift my own voice in full-throated ascent to this call for a "new Oxford Movement." But to me this does not mean rejecting the heritage bequeathed to us from the Reformation era via the Elizabethan Settlement. It means a re-emphasis of what the proposed canon of Elizabeth I quoted at the top of this blog calls "the Doctrine of the Old Testament and the New, and that which the Catholick Fathers and Ancient Bishops have gathered out of that Doctrine." It is the Faith that Bishop John Jewel called in his Apology for the Church of England "the faith which they shall see confirmed by the words of Christ, by the writings of the Apostles, by the testimonies of the Catholic fathers." These comments will, of course, be disturbing to that small minority of orthodox Anglicans that see Anglicanism as nothing more than one expression of Reformed Protestantism out of many equally valid expressions. But I am sure the overwhelming majority of folks in this diocese, and I suspect a great many within ACNA more generally, will welcome Bishop Ackerman's call whole-heartedly. St. Mike's Was an Enriching Experience--As Always! 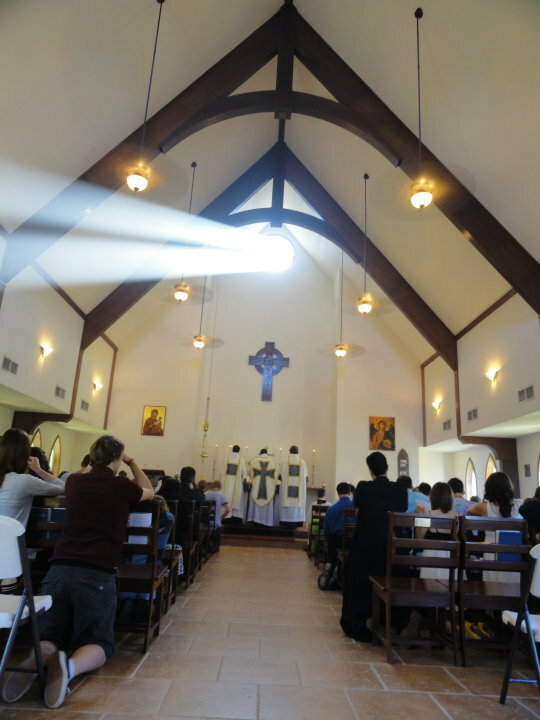 St. Michael's Youth Conference--Southwest, a six-day Anglo-Catholic spiritual retreat for twelve-to-twenty-year old youth, concluded yesterday at Camp Crucis near Granbury, Texas. It was a wonderful experience for the kids and for the faculty and counselors. I was a Bible instructor again, teaching the required "Receiving the Word of God" survey class and an elective on the Revelation to St. John. This was my third time to teach at St. Mike's, so I received the coveted St. Michael the Archangel Medal that all three-time Michaelites receive in accordance with custom. We all met daily for Morning Prayer, a Solemn High Eucharist, Evensong (that is me above officiating at Evensong on Thursday evening), Compline, and on Wednesday night we stayed for Benediction as well. Every day the kids all took three classes taught by clergy on a variety of subjects, including Scripture, Theology, Ethics, and Liturgy. There were also several meaningful discussion groups every night, as well as plenty of fun activities. The week ends with "The Pageant of Salvation," a dramatic presentation of Scripture readings put on by the young people. Each year I am especially moved by the Blessed Virgin Mary carrying the Pascal candle into the church as a symbol of the Incarnation. 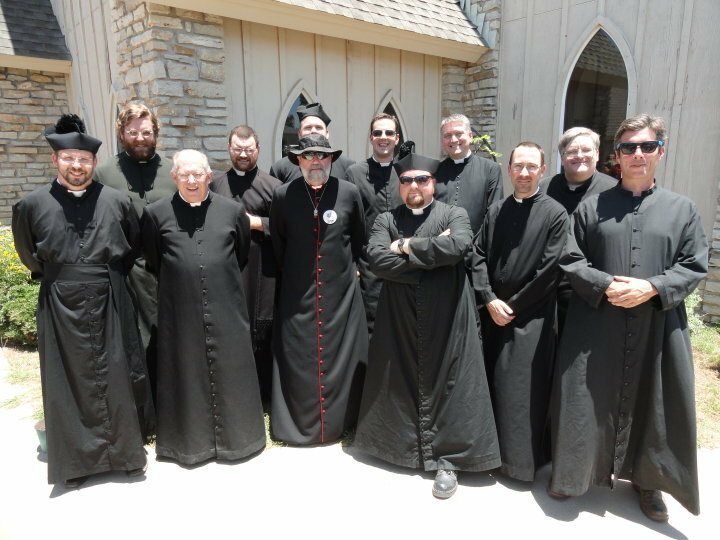 We had kids and faculty from all over North Texas taking part, both from within ACNA and from traditionalist parishes still within TEC. We even had a priest, two kids, and a counselor with us from the diocese of San Joaquin, California! Keep your eyes peeled for information about next year's St. Mike's. BTW, the whiteboard above was "left behind" after one of our numerous evening discussion groups. Can you guess what the topic was? Very Positive Developments in the ACNA! The Living Church has a report on the recently concluded ACNA annual meeting. It reports a number of encouraging bits of news (italicized emphasis added by me). Officials of the Anglican Church in North America (ACNA), which launched a year ago as an alternative to the Episcopal Church, are reporting significant progress in their efforts to share Eucharist with other churches and to do evangelism alongside messianic Jews. 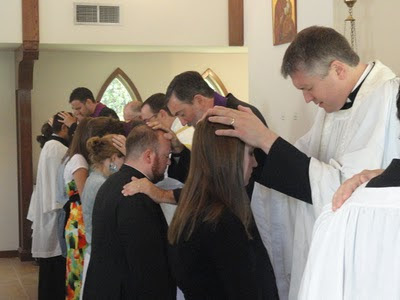 In a report delivered at the ACNA’s annual meeting in Amesbury, Mass., on June 9, ecumenism task force chairman Ray Sutton listed a series of recent milestones that show how the ACNA is forging connections outside mainline Protestantism. Dialogues with the Orthodox Church in America have reportedly knocked down one of the centuries-old barriers that have kept Anglican and Orthodox Christians from sharing Eucharist. 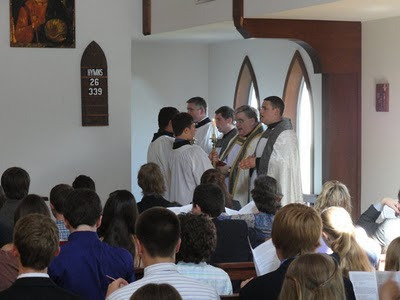 The big concession: when sharing Eucharist, the ACNA would confess that the Holy Spirit proceeds from the Father and not add the phrase and the Son, as Western Christians traditionally do in a formulation called the Filioque. RWF: When I appeared before the Commission on Ministry to receive final approval to be ordained a priest the chairman asked me if I believed everything in the Nicene Creed. 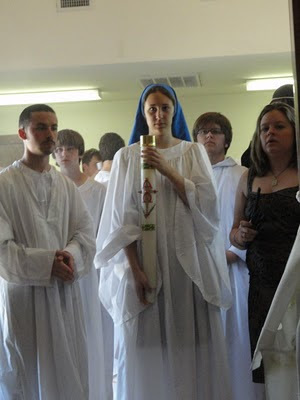 (It is good that they ask that question around here multiple times during the ordination process!) I told him I believed every single word of it with all my heart. But, I added, if the price of unity was the Orthodox Churches was our jettisoning the Filioque clause I would do it in a heartbeat as the West really had no business adding it unilaterally in the first place. So I consider this a great step in the right direction. May God hasten their efforts! What’s more, the Lutheran Church–Missouri Synod has lined up four meetings with ACNA representatives at seminaries later this year as the two denominations explore potential for Eucharistic sharing. RWF: After I came to know Christ our Savior in my twenty-third year among the first works of theology I read were Luther's three great essays of 1521. Brother Martin's thought has deeply marked my own. (I will wager that I am the only clergyman in the diocese of Fort Worth who has taken a four-week "Footsteps of Luther" study tour in Germany.) I would be absolutely delighted if this dialogue with the Missouri Synod bore fruit. The ACNA is also inviting 17 messianic Jewish groups to a September summit to explore “how we can do ministry together,” Sutton said. RWF: Interesting. May many people of all backgrounds coming to saving faith through this initiative. Sutton’s report, which delegates received with rousing applause, comes as former Episcopal congregations now affiliated with the ACNA seek to establish a distinct, non-Episcopal identity. In addition to building bridges with other Christian communities, the ACNA aspires to define itself as a dynamic movement by planting 1,000 new churches within its first five years. 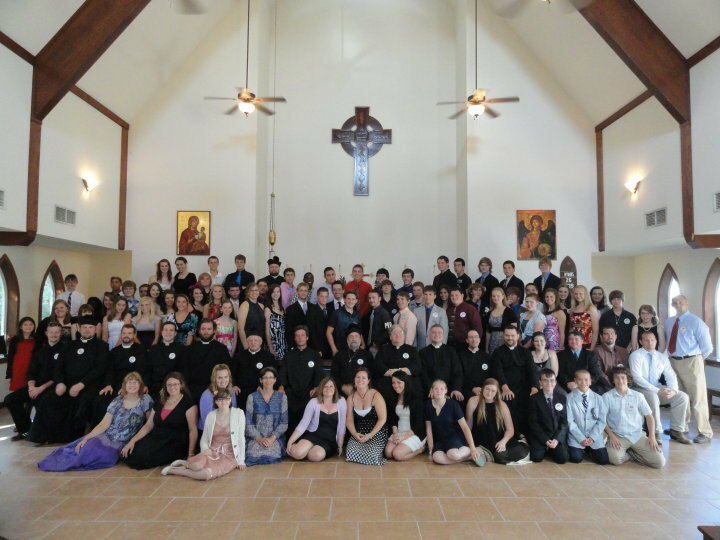 The ACNA is growing, albeit not as fast as some would like. Archbishop Robert Duncan, in his state-of-the-church address to about 100 delegates and bishops from across North America, noted that the church has swelled from 703 congregations a year ago to 811 now. Prospects for further growth, Sutton said, include welcoming as many as 150 Evangelical Lutheran Church in America congregations that are considering a move to the ACNA. RWF: WOW! I wonder how this affects plans for the North American Lutheran Church. The theologically conservative ACNA continues to tread in controversial waters as it carves a niche. Evangelizing Jews, for example, would put the ACNA at odds with most mainstream Jewish groups, which oppose the practice as an affront to Jewish identity. Also, whether to ordain women to the priesthood remains “an issue that divides us,” Duncan acknowledged in his address. Women’s ordination was on the agenda for panel discussion at the June 10-11 College of Bishops meeting, which was closed to lay delegates and press. For now, the ACNA shows little appetite for internal conflict. Content to tolerate diversity of practice on women’s ordination, delegates to the Provincial Council avoided the issue and characterized their movement as more about unification, rather than fragmentation, within Anglicanism. Preserving certain strong relationships within the Anglican Communion proved to be a priority at All Saints Anglican Church, Amesbury, as the ACNA marked its first anniversary. The Rev. Lynne L. Ashmead, a deacon and the ACNA’s registrar, cautioned that dioceses need to follow specific record-keeping protocol in conformity with Communion-wide standards. Delegates likewise signaled deference to the Province of Rwanda when they affirmed the Anglican Mission in the Americas as a “ministry partner” that would remain under Rwandan jurisdiction rather than the ACNA’s.